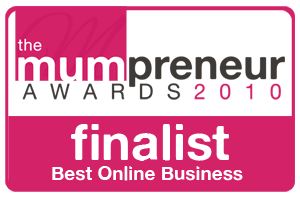 After nine and a half years of running my business the time has come to wrap it up! Back in 2008 when I set up my business I wouldn't have for a moment dreamed of how much I would enjoy being my own boss! It came at a perfect time, when I needed something to concentrate on - something to get my creative juices flowing and sharpen my skills. I have had some real highs and some real lows but it's been worth every minute! I have been very lucky to have some loyal customers who I have created portraits for on a yearly basis and watched their children grow with every new photo they send me to work with. I am not sure if this is a 'forever' goodbye or if one day I will want to relaunch - no one can predict what the future holds but the beauty of this is I know I will continue to have ideas which one day I may find the time to develop. I would like to wish all my customers all the very best and hope you all know how much I have appreciated your business. 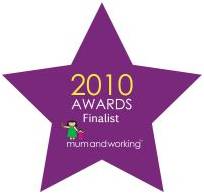 I would also like to thank all the lovely work at home Mums who helped advise and support me in the early days - there is a fantastic network of support out there for anyone looking to set up their own business and it's been an invaluable resource for me these past 9 years! 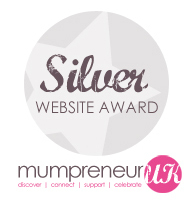 I was a member of a number of different 'Mumpreneur' networks and websites and really appreciated all of them! I would like to thank all the very talented children who entered the Creative Competition! 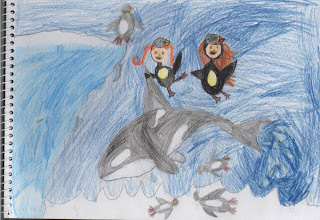 who drew this fantastic Antarctica scene with her and a friend dressed as penguins is the WINNER! Well done Summer....you have won A magical portrait created in the same theme as your creation and a 16"x12" poster print. Can your Mummy please email me at info@enhance-me.com a photo of you and your friend for your portrait!? I am looking forward to recreating your lovely picture! It's been a while since I last updated my blog! This year seems to be going so quickly. I can't believe my children are back at school/nursery already after thier seven week Summer holiday! Unfortunately the weather didn't seem to agree and it was a pretty dull seven weeks. Lots of crafts, baking and films helped keep them occupied but we missed those long Summer days enjoying BBQs and the paddling pool. 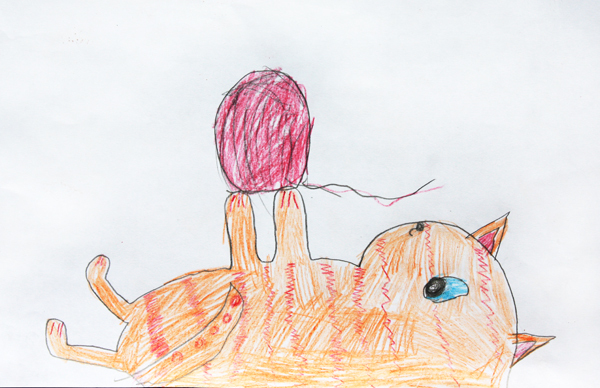 My daughter spent a lot of the Summer sitting at the kitchen table surrounded by pencils and paper, drawing. She is very creative and really loves anything arty. I want to share this lovely picture she drew me among many others. 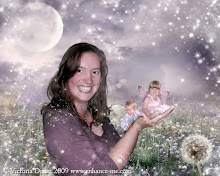 All you need to do is get your child/children to create a picture of themselves in a 'magical scene' - where would they most like to be?...Would they like to be in a fairy garden surrounded by butterflies and fairies? Perhaps they would like to go on a bug safari and ride on a dragonfly! Or do they love dinosaurs? Perhaps they would love to be on stage with thier favourite pop star! They can use anything they want, pens, pencils, paint, collage! 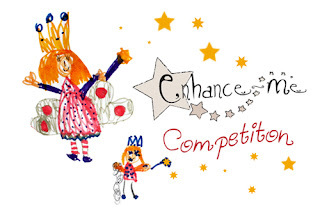 The Prize: A magical portrait created in the same theme as your childs creation and a 16"x12" poster print. Please remember to include your childs name, age and description of what they have created! I am really looking forward to seeing all the fab creations! Are you looking for a UNIQUE gift for Fathers Day? 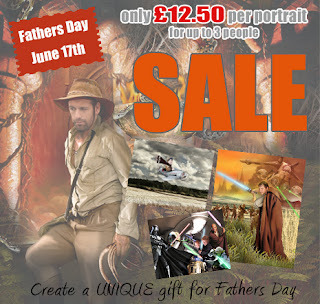 Are you looking for something completely different for Fathers Day? 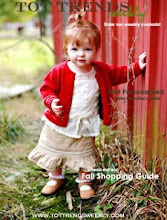 Why not make the most of our SALE? Is you Dad or husband a fan of a particular TV show or film? Does he like fishing or football? Anything is possible! SALE NOW ON - visit my website http://www.enhance-me.com/ for more details. Orders for Fathers day must be placed by June 7th at the latest. I decided to then mix things up a little to make it fairer and do a draw between all those who did guess correctly and it returned the same winner so it was meant to be!! So a HUGE well done to the winner, who correctly guessed 47 eggs 'Emma Sealey' You have won a portrait in a theme of your choice and an 8x10 print of your portrait. I am looking forward to creating something for you. Thank you everyone for your entries and keep your eyes open for more competitions and special offers in the future. Hope you all have a wonderful Easter weekend! I haven't updated my blog for some time - I am terrible at blogging regularly and realise this every time I return to post! Today is the last day of term before the school breaks up for the Easter Holidays and what better way to start the Easter break than with a competition!? 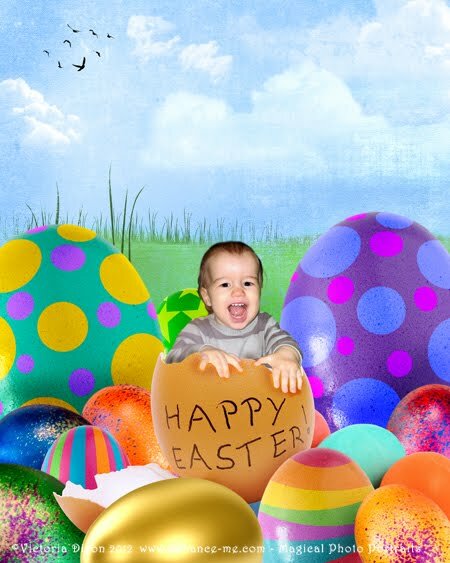 It's simple really - all you need to do is visit my facebook page and post a comment here in reply to this post to let me know how many Easter Eggs there are hidden in my Timeline cover photo? The closest guess will win a portrait in a theme of thier choice and 8x10 print. Closing date is April the 6th at midday (12pm GMT) (a week from today!) so start guessing and good luck. Christmas (dare I say it!!) is a special time of the year and as we all know it can be difficult finding something that is unique to give to friends and family. Enhance-Me are launching a few new services in the approach to this Christmas that may just help add that extra sparkle to your greetings! So have a look here at what Enhance-Me can offer you! Imagine your Christmas portrait moving, dancing with snowflakes.... the new personalised E card is a great way to add something extra magic to your Christmas portrait this year! You can have your personalised Christmas portrait created and printed onto cards – imagine your child as the star! I might be able to accommodate digital orders beyond these dates. Please contact me, telling me what it is you need, and I will let you know if I will be able to process an order for you.